Experience next generation clean with the Philips Sonicare ProtectiveClean 6100 Electric Toothbrush with Travel Case, a smart toothbrush that uses sonic technology to lift away dirt and plaque for a more confident smile. Performing a gentle yet effective clean, the electric toothbrush has three modes (Clean, White and Gum Care) and three intensities, allowing you to personalise your brushing routine. Guiding you through your brushing experience, the toothbrush has a Quadpacer which signals when to move on to a different section of your mouth, and a Smartimer to determine when total brushing time is done. Microchipped-enabled technology detects and synchronises the smart brush head with the smart handle for smart mode pairing, and a brush head replacement reminder lets you know when your brush head is no longer performing optimally too, ensuring the best possible results are upheld. It also has an in-built pressure sensor which tells you when you are brushing too hard to help prevent damage to teeth and gums. 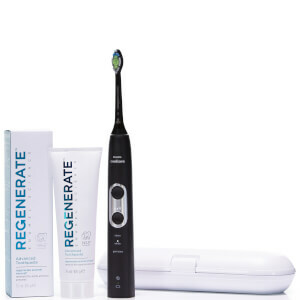 Complete with a travel case for convenience, and a tube of Regenerate Advanced Toothpaste. 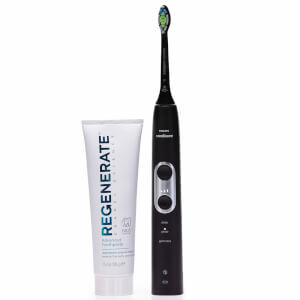 Brush for two minutes twice a day for increased plaque removal for healthier teeth and gums in only 2 weeks*. Suitable for use with braces, fillings, crowns and veneers. Achieve whiter teeth in just 1 week vs a manual toothbrush. Pressure sensor, 3 cleaning modes and 3 intensities deliver an ultimate brushing experience. Smart brush head replacement reminder alerts you when to replace your brush head for effective cleaning, every time. Travel case & bonus brush head. 2 weeks battery life limiting the need for frequent charging.